I LOVE, LOVE, LOVE these adorable sandals. There’s something about green in the spring and summer, it’s just natural. You can wear it with almost anything for a kicky pop of color. As I sit here to type this post, I’m wearing a pair of white capri jeans and a navy blue and white sailor-like T-shirt. 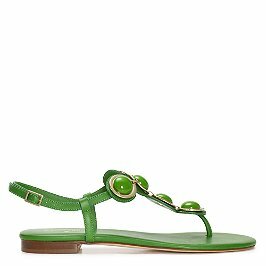 What better shoes to throw on than these cute Kate Spade Fawna sandals?